In a conversation with Restaurant India, Uday Mathur, co-founder, Tea Trails India, talks about the challenges in the retail business. You have raised one million funding from a group of high net worth individuals. Where do you plan to use them? Currently, we have eight stores in Mumbai, out of which, six of them are company owned and two of them are franchises. We have a plan to go pan- India. In three months, we will start our franchise model, and also plan to open 400 outlets by next five years. Funding that we have now will be used in expansion, building a good team and company owned outlets. How did the idea of starting a ‘Tea Chain’ initiate? What was the initial funding? We have been studying about tea for four years by now. Three of us, my wife, Ganesh Vishwanathan and myself used to run a company called Bureaucrat, about two years back we sold the stake. From then on, we are looking into opportunities to enter into another business and we are looking at something which is durable. There are a lot of potentials for cafe markets. Coffee continues to be a very large product in the beverage market, but there is a high level of growth and that will be driven by the younger generation. Opportunity, we believe is extremely big in India. We are so called the tea consuming country and also the second largest producer of tea in the world. India produces the best quality tea and at the right temperature. There is a large segment of people drinking chai in India and tea consumption in India is much larger compared to coffee. So, we got the idea of cafe, did a lot of research on this as no one has done on it. Around 80 varieties of tea are present in India, then we conceptualised the whole concept of tea. International tea comes from countries like Japan, China, Turkey, South Africa and the best tea comes from Assam. In India, people understand tea like masala chai, adrak chai what we drink. Initially, the amount we put in the company was 2crores. What is the main challenge in operating this business? How do you manage it? We are still in the learning process. But the great challenge in the retail business is the cost of real estate. Though now everyone is talking about the slowdown process in the real estate market. That is the greatest challenge we have in the market. You have to maximise your cafes and outlets for people who are coming at breakfast time, lunch time or dinner times, so you need to maximise it accordingly. 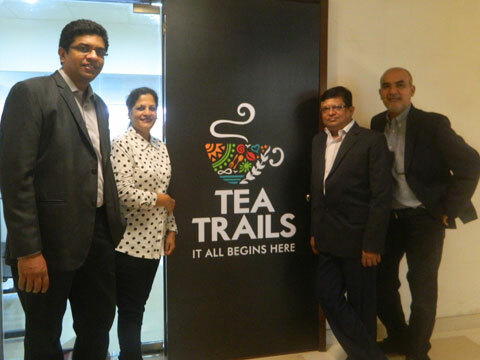 How is Tea Trails different from other tea brands? We believe in competition and it is always good. You can show the best chai or new combinations to your customers. We are not competing with the roadside vendors as they have “cutting chai” kind of thing. In terms of food also, we only serve fresh food. It can also show our potential. We have chosen to franchise and give the best quality of teas to our customers. What is the current market of Tea business in India? Where do you stand today? It is somewhere around 20,000 crore market in India and it is still growing. Today, it is predominant by coffee but later by 2020, it will be dominant with tea chains. Today, we are in a very early stage so our growth is negligible. So, definitely in a couple of years, we will be at number 1 position. What is your total revenue? And what is your target revenue for this fiscal? I don’t have the exact numbers with me. A lot is opening up. Mainly, I am looking at the expansion plans. By 2016-2017, we are putting in resources and expecting returns in future. In terms of location, it will be pan-India. We are doing franchising and in talks with people on franchising. We are also looking at territories like Andhra Pradesh and Tamil Nadu. Licious to open 10-15 hubs in the next six months..